Pieter Brueghel the Elder (1526/1530–1569), The Magpie on the Gallows (detail) (1568), oil on oak, 46 x 51 cm, Hessisches Landesmuseum Darmstadt, Darmstadt, Germany. Wikimedia Commons. 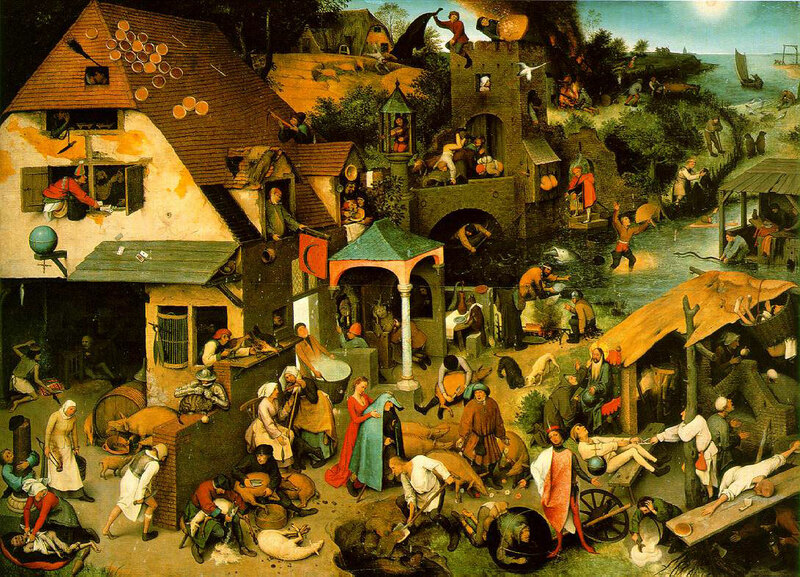 Pieter Brueghel (or Bruegel) the Elder was one of the founding fathers of modern painting; the more that I look at his work, the more amazed I am at his extraordinary innovation. In this article I will focus on his use of figures in some of the best of his landscape paintings, and try to show how profound and lasting his ideas and their influence have been. Although only about forty of Brueghel’s paintings survive today, they span the genres from religious and traditional narrative, to pure landscape. As with Poussin, stories are so pervasive in his paintings that it is very tempting to try to read all his paintings as being narrative in intent. Although this is only a copy, possibly painted by de Momper, of Brueghel’s original, it illustrates effectively some of the dangers we face in reading a Brueghel. It would be easy to walk past Landscape with the Fall of Icarus and miss the story of Icarus altogether. All Breughel gives us is a pair of legs thrashing in the water, a few feathers floating down in the air above them, and a shepherd looking up at the sky. The legs, of course, belong to Icarus, who has just plunged into the sea after flying too close to the sun. 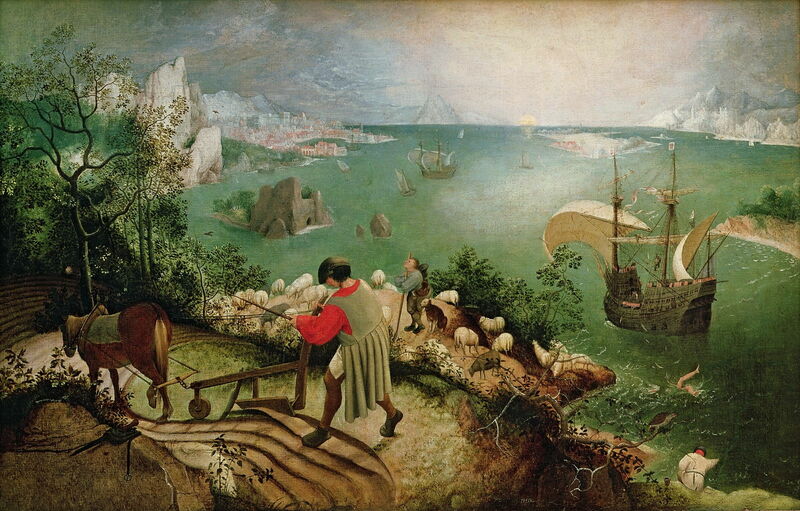 His father, Daedalus, is off beyond the upper left of the panel, being watched by the shepherd. Brueghel also flooded his landscapes with figures in a manner which has remained very popular in different types of image even today. His best example is his encyclopaedic collection of Dutch Proverbs (1559). Pieter Brueghel the Elder (1526/1530–1569), Dutch Proverbs (1559), oil on oak wood, 117 x 163 cm, Gemäldegalerie, Berlin. Wikimedia Commons. Here the landscape is so contrived and the figures so extraordinary in their activities that they demand our close attention. Armed with a compendium of Dutch proverbs of the day, the painting finally makes sense. Here is just a small sample to whet your appetite. 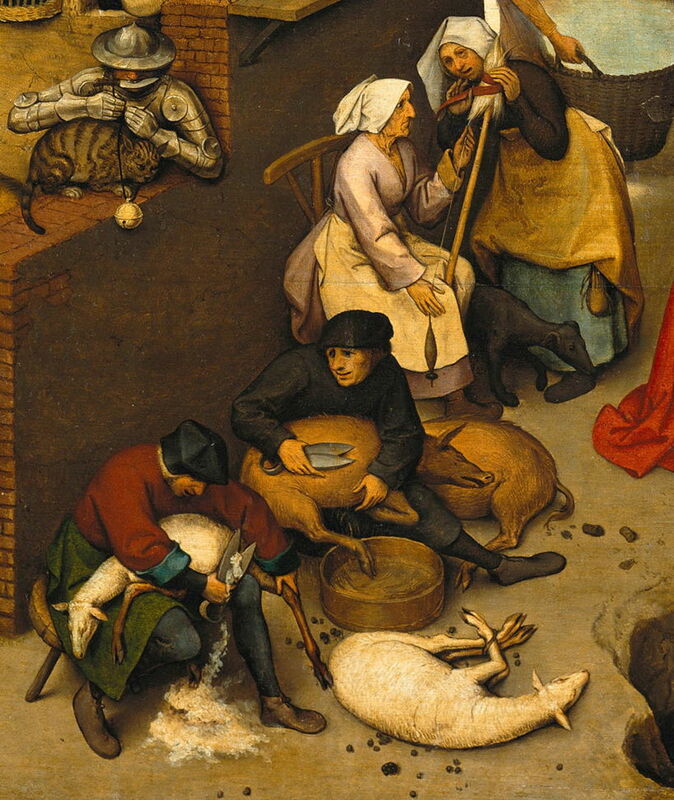 Pieter Brueghel the Elder (1526/1530–1569), Dutch Proverbs (detail) (1559), oil on oak wood, 117 x 163 cm, Gemäldegalerie, Berlin. Wikimedia Commons. to be as tame as a lamb (very obedient). 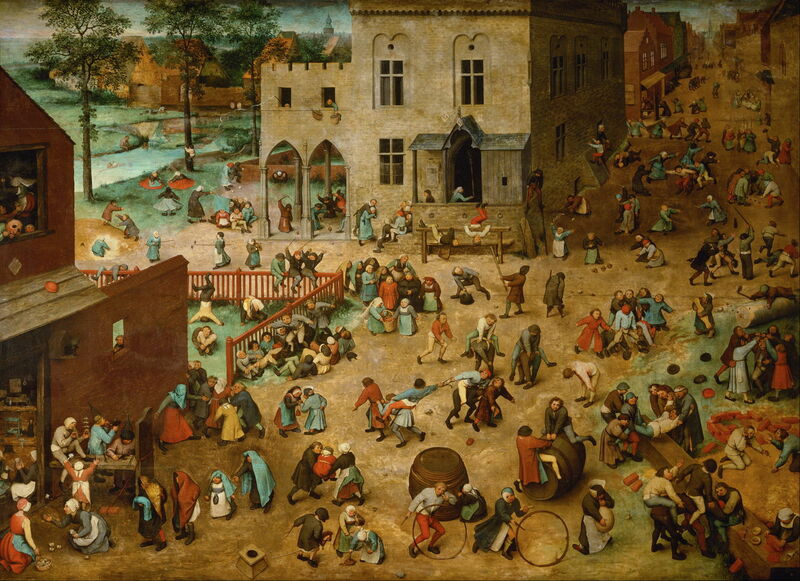 Pieter Brueghel the Elder (1526/1530–1569), Children’s Games (1560), oil on wood, 118 x 161 cm, Kunsthistorisches Museum, Vienna, Austria. Wikimedia Commons. He repeated this the following year with Children’s Games (1560), which I also show below in a detail. This time the painting appears less contrived, and until you study the figures carefully, you might not notice that this work is an illustrated encyclopaedia of the games of childhood at the time. 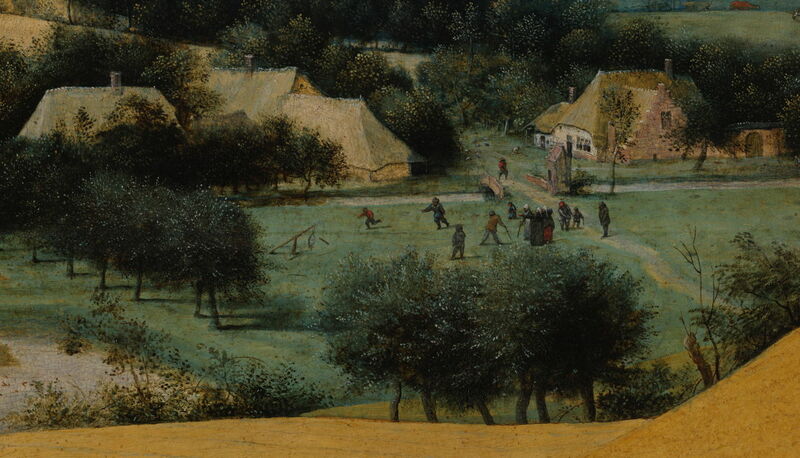 Pieter Brueghel the Elder (1526/1530–1569), Children’s Games (detail) (1560), oil on wood, 118 x 161 cm, Kunsthistorisches Museum, Vienna, Austria. Wikimedia Commons. 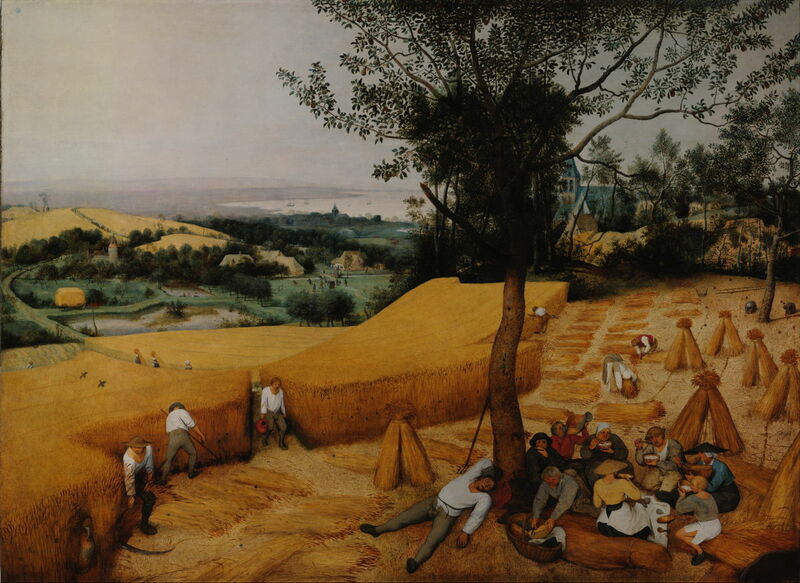 Knowing that Brueghel might be out to trick us, we should be wary of a more innocent work, such as The Harvesters (1565), hailed by some as the ‘first modern landscape’ painting. Pieter Brueghel the Elder (1526/1530–1569), The Harvesters (1565), oil on panel, 119 x 162 cm, Metropolitan Museum of Art, New York, NY. Wikimedia Commons. Are those country people just working on the harvest, in the way that Poussin’s harvesters are behind the narrative of his Summer (1664)? 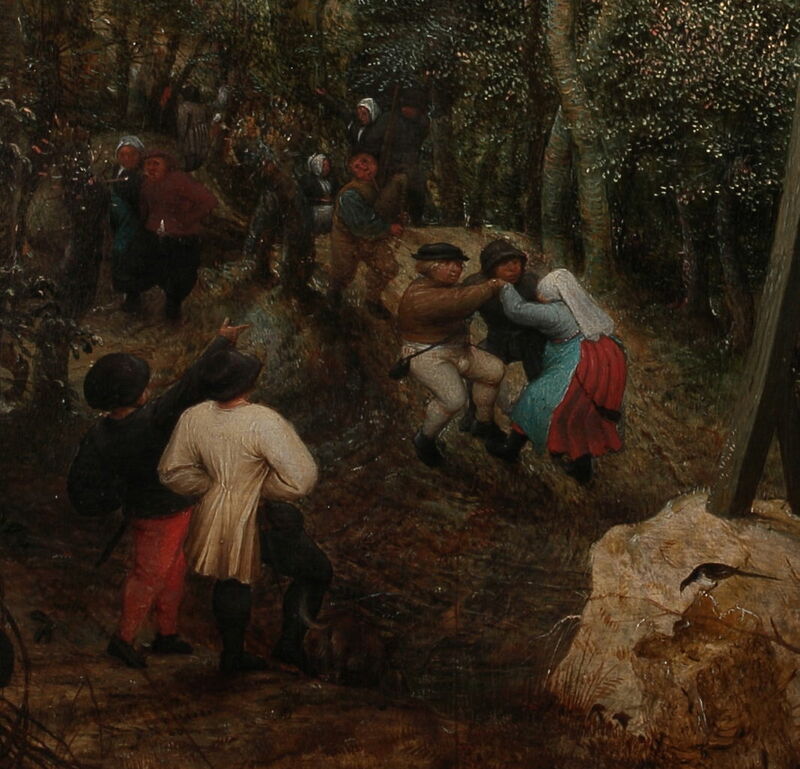 Careful study of details reveals that there is narrative coherence through many passages of Brueghel’s painting. This not just a snapshot of a moment in the country, but a cunningly composed story. In the left foreground, the corn is being cut and stood into stooks. To the right is a group who are enjoying a meal under the shade of a pear tree. Pieter Brueghel the Elder (1526/1530–1569), The Harvesters (detail) (1565), oil on panel, 119 x 162 cm, Metropolitan Museum of Art, New York, NY. Wikimedia Commons. 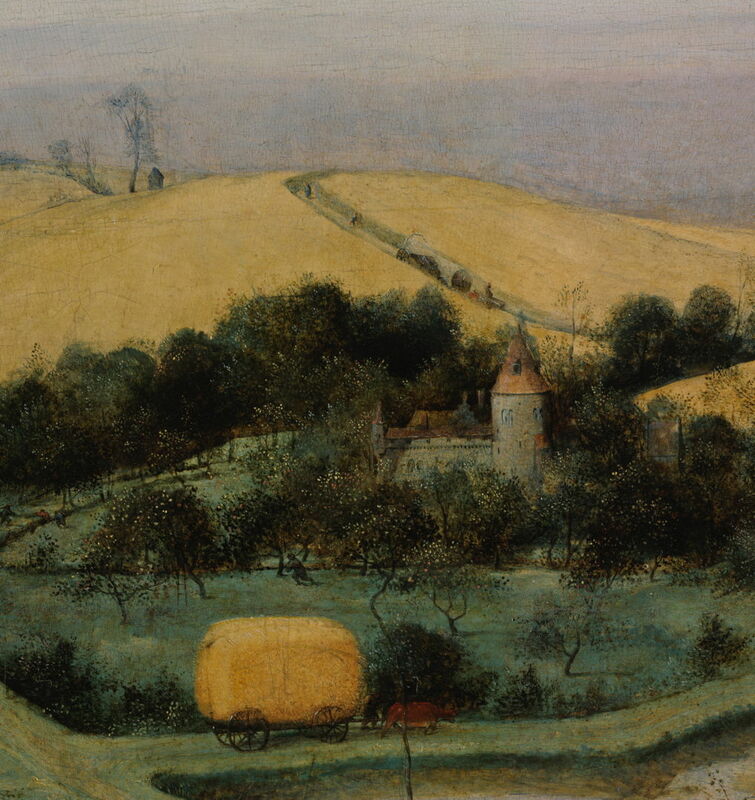 In the left middle distance a haywain is being towed along a road leading to the farm. Behind that a covered wagon and a couple of pedestrians are making their way along a narrow lane, which passes through more ripe grain ready for harvest. In the centre middle distance is a hamlet, alongside a brook. A group of villagers are playing a traditional game on the green. 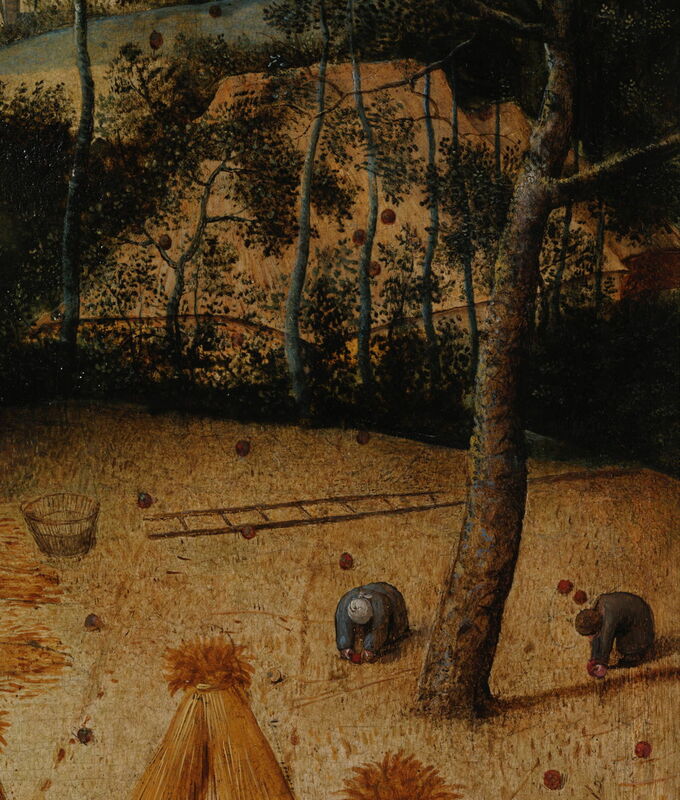 At the far side of the field being harvested, and at the right edge of the painting, two people are collecting pears which are falling from the fruit tree growing there. Together, these details tell the story of the production, harvesting, and consumption of food at the time of plenty, in the late summer. If Brueghel had placed an identical individual in each of the groups of people, I’d term it multiplex narrative, just like in so many other paintings of the Renaissance. Compositions such as Dutch Proverbs, Children’s Games and The Harvesters are still popular in illustrations in modern children’s books. And I fancy many parents and other adults take great delight today in helping their children to read those illustrations, and sometimes even without the excuse of a child. 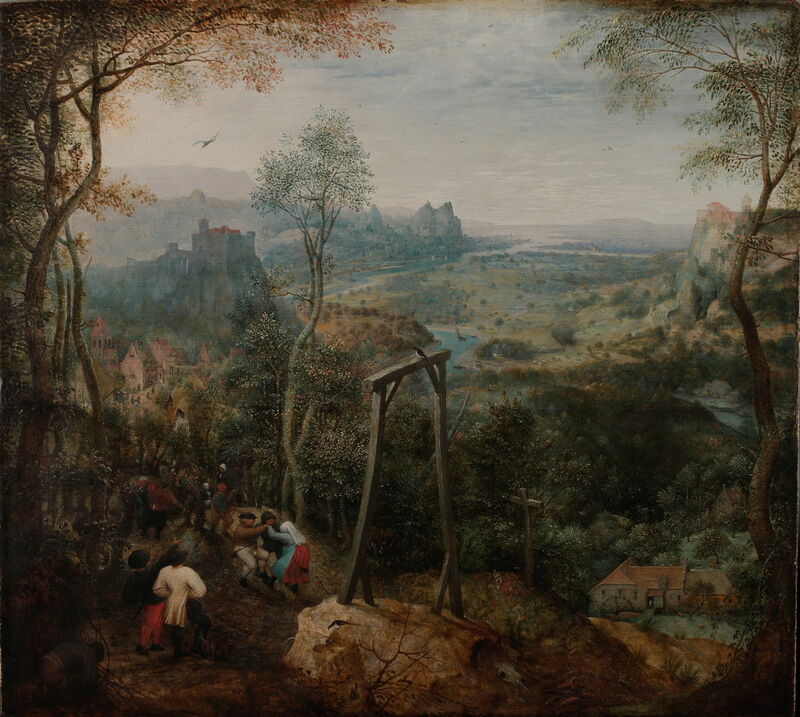 So are any of Brueghel’s landscapes with figures pure, and non-narrative? Pieter Brueghel the Elder (1526/1530–1569), The Magpie on the Gallows (1568), oil on oak, 46 x 51 cm, Hessisches Landesmuseum Darmstadt, Darmstadt, Germany. Wikimedia Commons. One strong contender must be The Magpie on the Gallows (1568). Even here it has been suggested that there may be allusions to popular proverbs, such as ‘dancing on the gallows’ meaning mocking the state, or the folk role of the magpie as a gossip (with its origins before Ovid, and his story of the Pierides who were transformed into magpies), and gossip as being life-endangering in times of political tension. The figures, though, shown in the detail below, are of country people dancing to the sound of bagpipes in a fairly normal rustic feast, and there seems nothing untoward about the splendid vista beyond. Pieter Brueghel the Elder (1526/1530–1569), Winter Landscape with Skaters and Bird Trap (1565), oil on panel, 37 x 55.5 cm, Royal Museums of Fine Arts of Belgium, Brussels. Wikimedia Commons. If you still have reservations about that work, what about Brueghel’s Winter Landscape with Skaters and Bird Trap (1565)? There are no figures particularly close by, and those on the ice are not demonstrating the many different activities which they could be undertaking. So these may be staffage in a pure landscape painting after all. 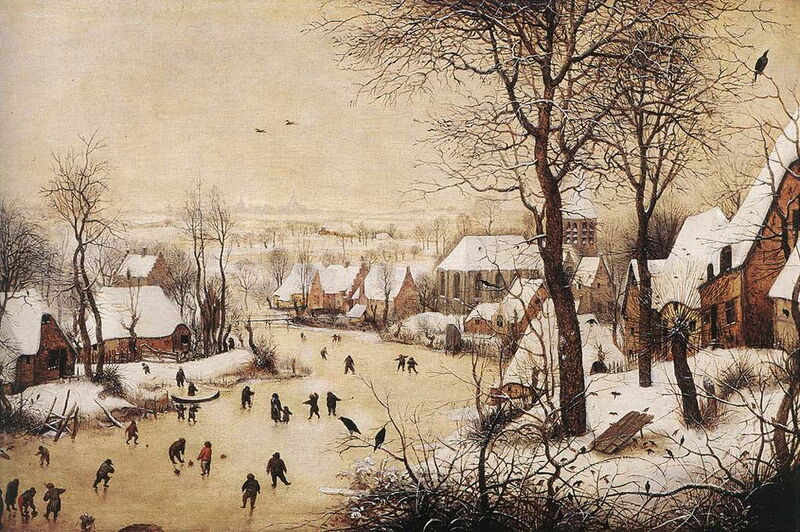 It also happens that this was one of the first paintings to show Netherlandish people on the ice in the winter – a theme which became very popular with successive generations of artists from that part of Europe, and whose influence extended throughout Europe, and across centuries and styles. 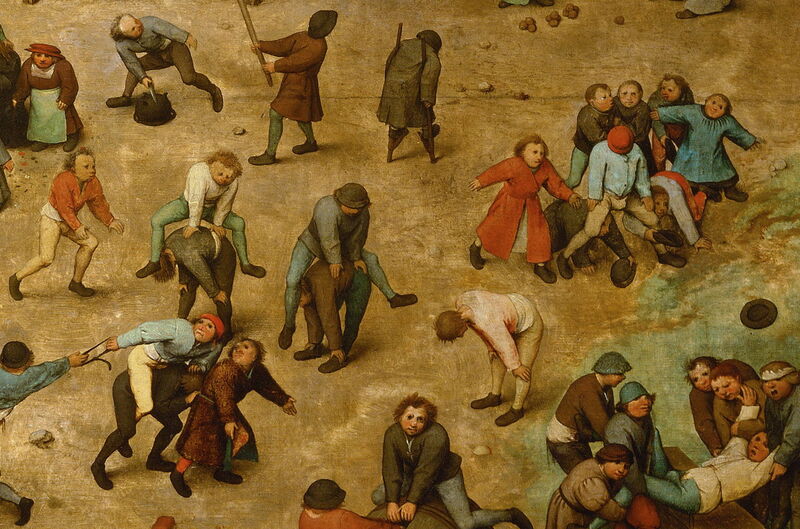 Pieter Brueghel the Elder’s works may now be few in number, but their influence has been enormous. Posted in General, Painting and tagged Bruegel, Brueghel, Daedalus, figures, landscape, narrative, painting, Poussin, staffage. Bookmark the permalink.